There are 47 Assisted Living Facilities in the Bethany area, with 3 in Bethany and 44 nearby. The average cost of assisted living in Bethany is $2,745 per month. This is lower than the national median of $3,346. Cheaper nearby regions include Del City with an average starting cost of $2,500. To help you with your search, browse the 400 reviews below for assisted living facilities in Bethany. On average, consumers rate assisted living in Bethany 3.6 out of 5 stars. Better rated regions include Yukon with an average rating of 4.2 out of 5 stars. Caring.com has helped thousands of families find high-quality senior care. To speak with one of our Family Advisors about assisted living options and costs in Bethany, call (855) 863-8283. Bethany is part of the Oklahoma City metropolex, and has been developing as a bedroom community for that area since 1930. The large number of retirees in this city is one of the primary reasons for its relatively high population of seniors. It also accounts for the large number of assisted living facilities in the area, with three in Bethany itself and another 45 in surrounding cities like Yukon. These facilities generally include multiple services for seniors, including assistance with daily living activities. 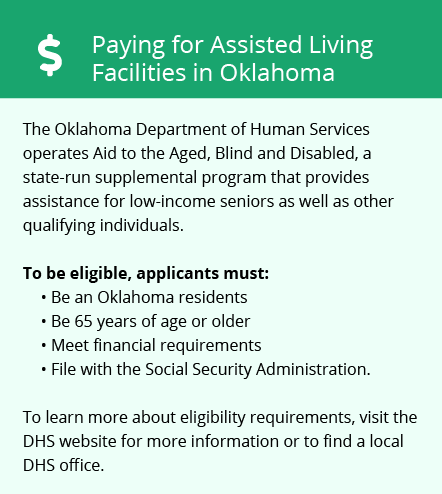 Facilities in Bethany, and elsewhere in the state, are regulated by the State Department of Health in Oklahoma, which defines them as assisted living centers. The summers are consistently warm in Bethany, but the temperatures during the winter are much more variable. The average high temperature during July is 93 degrees, and the average low is 71 degrees. Freezing temperatures are common during the winter, so seniors may want to limit their outdoor exposure and remain alert for icy conditions during this time of year. Bethany’s overall cost of living is 83 percent of the national average, which is typical for a suburb of Oklahoma City. Groceries are 89 percent of the U.S. average, and utilities are 93 percent of the average. Other expenses are slightly below the national average, so seniors will likely find living in Bethany to be affordable. Bethany’s overall crime rate is higher than that of 88 percent of all cities in the U.S. However, its rate of violent crime is quite low, at 3.12 per thousand people per year, compared to 4.5 for Oklahoma and 4.0 for the U.S. as a whole. The biggest concern for senior citizens may, therefore, be property crime. Embark provides public transportation throughout the Oklahoma City metroplex, with Bethany primarily receiving service from Route 10. Many passengers pay half the standard fare, including seniors over the age of 65. Embark also provides various passes at half price for seniors. The Warr Acres Community Center in neighboring Warr Acres sponsors a variety of activities for seniors 55 and over, including exercise classes, Wii tournaments and Bible study. Volunteer projects and field trips are also part of the regular schedule. This community center serves hot lunches five days a week. The Bethany area is home to world-class medical facilities, including Deaconess Hospital and Allied Medical Centers, in the event of medical emergencies or illness. Assisted Living costs in Bethany start around $2,745 per month on average, while the nationwide average cost of assisted living is $4,000 per month, according to the latest figures from Genworth’s Cost of Care Survey. It’s important to note that assisted living rates in Bethany and the surrounding suburbs can vary widely based on factors such as location, the level of care needed, apartment size and the types of amenities offered at each community. 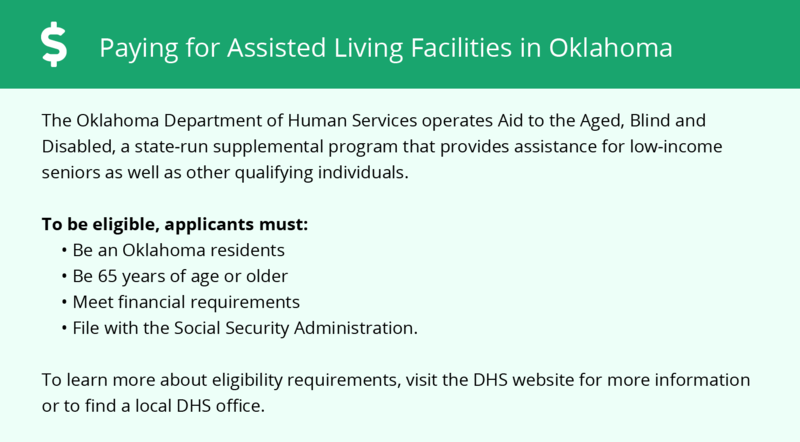 Oklahoma’s Advantage plan provides a Medicaid waiver for seniors in Bethany who need financial assistance for assisted living. The Medicaid State Plan can also provide assistance with daily living activities in Bethany. Bethany and the surrounding area are home to numerous government agencies and non-profit organizations offering help for seniors searching for or currently residing in an assisted living community. These organizations can also provide assistance in a number of other eldercare services such as geriatric care management, elder law advice, estate planning, finding home care and health and wellness programs. To see a list of free assisted living resources in Bethany, please visit our Assisted Living in Oklahoma page. Bethany-area assisted living communities must adhere to the comprehensive set of state laws and regulations that all assisted living communities in Oklahoma are required to follow. Visit our Assisted Living in Oklahoma page for more information about these laws.